Cllected by James Lipscomb and Margaret Lipscomb. Bill's list of humor in his scientific publications. 2. “We admittedly made this observation with the benefit of hindsight. This science is known as retrospectroscopy.” E. A. Laws, R. M. Stevens, and W. N. Lipscomb, J. Am. Chem. Soc. 94, 4473 (1972). 4. “In the early 1970’s we frequently superimposed a diffraction pattern of aluminum powder on single crystal X-ray photographs [for calibration]. The mounted sample, labeled as Al Powder, was thought by one member of my research group to be labeled by the name of a previous member of the group. Hence the quotation,” “We also wish to thank Al Powder for assistance in the calibration of the unit cell parameters.” C. H. Schwalbe, and W. N. Lipscomb, Inorganic Chem. 10, 160 (1971). 6. “We also thank Alice, the cow, who while nevertheless still living, supplied the pancreatic juice from which our crystals of the enzyme carboxypeptidase were obtained.” W. N. Lipscomb, J. 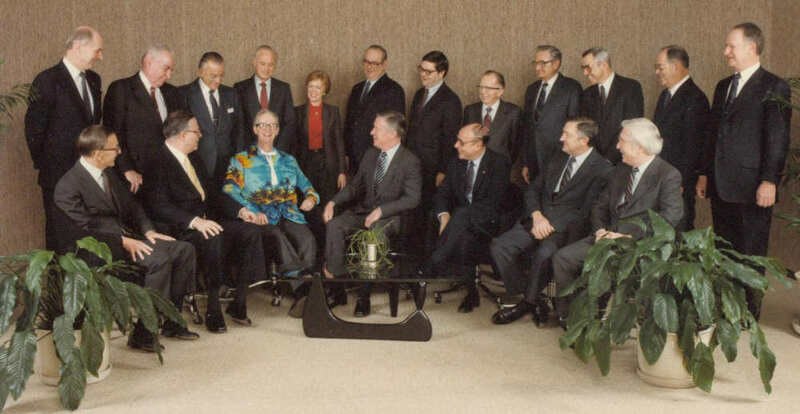 A. Hartsuck, G. N. Reeke, Jr., F. A. Quiocho, P. H. Bethge, M. L. Ludwig, T. A. Steitz, H. Muirhead, and J. C. Coppola, Brookhaven Symp. Biol. 21, 85 (1968). 16. The footnote, “M. V. King and W. N. Lipscomb, to be unpublished,” W. N. Lipscomb, J. Chem. Phys. 22, 986 (1954). 18. “We wish to thank the Office of Navel Research….” R. Hegstrom and W. N. Lipscomb, J. Chem. Phys. 46, 4539 (1967). The error, Navel, as in belly-button, was made by the journal when typing the galley proofs. Bill let it be published, but, as a gentleman, had it corrected for the reprints. Humor in Science. Bill's list 1-25 (unpublished, except of course here on the Internet and in pieces in the publications cited). A spoof paper in manuscript (#25 in Bill's Humor in Science list above) published as "Ein neues Enzym" in Nachrichten aus Chemie und Technik, v19, #7, p122 (1971). Humor in the categories of enzyme humor, crystallography humor, crystal structure humor, and electron density map humor. In the Propositions section, page 71 in the text (PDF page 83 of 86). 11 (a) "Research and study at the Institute has been unnecessarily hampered by the present policy of not heating the buildings on weekends." 11 (b) "Manure should not be used as a fertilizer on ground adjacent to the Campus Coffee Shop." Bill's Ph. D. Dissertation (PDF). See the Propositions section, page 71 in the text (PDF page 83 of 86). Lipscomb, William N. (1946) Part 1, Electron diffraction investigations of vanadium tetrachloride, dimethylketene dimer, tetrachloroethylene, and trichloroethylene; Part 2, The crystal structure of methylammonium chloride. Dissertation, California Institute of Technology. Bill enjoys showing a Staffans Stollar comic in a Swedish newspaper, Oct. 24,1976, in which a couple is trying to figure out his Nobel Prize. The wife asks the husband, "Can you remember ever having seen a borane Gustav?" The award was really for Bill's development of a better understanding of the chemical bond (ethane barrier, three-center bond, diamond-square-diamond rearrangement, etc.). But the Swedish Academy had to approach that tangentially because they have been directed towards the tangible and the practical, which has, "... conferred the greatest benefit on mankind." While this does not exclude basic research, whose benefit may be more in the future, it is a stretch. So, they picked a subset of the list above as it applies to boranes. a better understanding of the nature of the chemical bond in boron chemistry, ethane, etc. But the Swedish Academy could not say that, because the award must be for a single, "... most important chemical discovery or improvement." We see that boron has one more electron than beryllium and one less electron than carbon. Bill sought to learn more about the nature of the chemical bond through calculation. But the computing time grows dramatically and beyond the possible very quickly with the number of electrons, placing most carbon compounds out of reach in the 1960s. The fewer electrons the better for calculations, but the chemistry of beryllium and lithium is correspondingly less complex. That leaves boron. 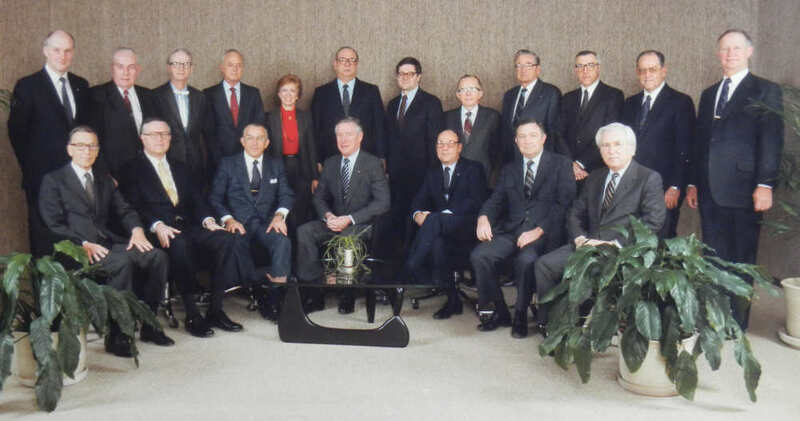 Bill served in a scientist position on the Dow Chemical Company Board of Directors from 1982 to 1990. He served on the Environment, Health and Safety Committee and the Public Interest Committee of the Dow Board of Directors. By 1984 Bill concluded that the group photos looked dull and added a Hawaiian shirt, which his daughter, Dorothy, bought for him. Bill also brought his regular shirt, back row third from the left. Bill was a frequent and enthusiastic participant in the Ig Nobel Prizes Ceremonies and other zaniness sponsored by Marc Abrahams of the Annals of Improbable Research. Special Issue Remembering Professor Lipscomb, pages 6-15. Download a free low-res PDF or buy a high-res PDF from: Annals of Improbable Research (AIR), Volume 17, Issue 43, July/Aug. 2011. _Ig Nobel Prize Ceremonies videos from 2001 to the present include Bill. Herbert Beall, songwriter and Bill's Ph.D. student, sings his borderline-satirical view of life in Bill's lab at Harvard in the 1960s. The satirical slant to the songs is much clearer in the way they are sung, playing the MP3 files instead if reading the lyrics. 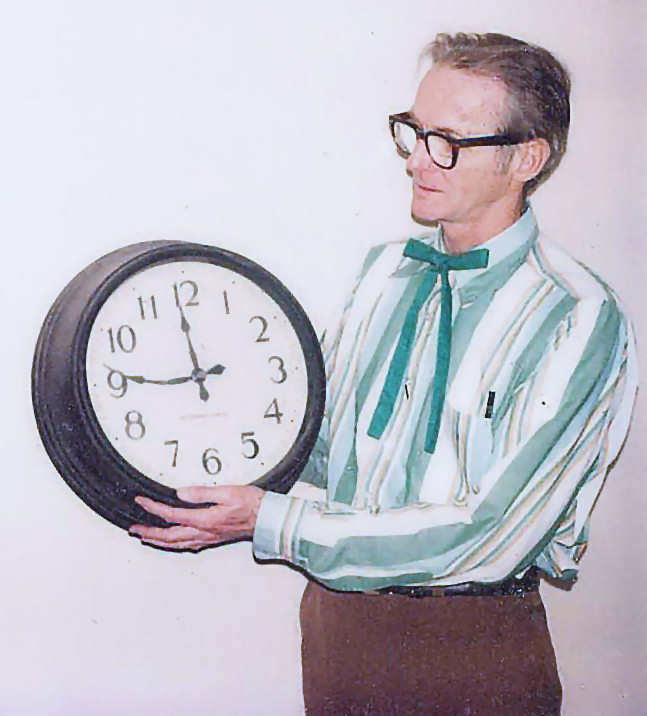 The hall clock outside of Bill's office in the Wolcott Gibbs Memorial Laboratory was five minutes slow. Bill was tired of being five minutes late to lectures, so he called Harvard Buildings and Grounds for someone to fix it. They replied that no, they would not, because it was impossible. The reason, they explained, was that because all clocks were ticked forward once each minute from a central control, if they sent five extra ticks to make his clock correct, then all the other clocks on campus would be five minutes ahead. No argument from Bill. He avoids personal confrontations, preferring technical replies. He got a ladder and found that by flipping the clock upside down at the half-minute mark he could advance it an extra tick every minute. But that solution was unsatisfying, so he took off the minute hand and went to the vise. The line "...bent and banged and swore," lampoons the fact that Bill was well known never, under any circumstances, to swear. Free music download with generous permission from Herb Beall's widow, Barbara A. Beall (see copyright section below). For it gives wrong time to both great and small and its will is made of stone. It's a model of life to weaker folk, inspirational is to me. Though the mightiest man it may provoke, it will never humbled be. Oh, sing aloud and n'er forget the strong proud clock that won’t be set. Now there came a man with an active mind, who prefers the world his way. Should he something less than perfection find, he will set it right that day. For to set it right he then made bold, ‘neath his will that clock must fall. But at last sad tears wet the clock’s proud face, and it could resist no more. Now it’s mutilated quiet and sad. It is far to tired to fight. Oh, sing aloud with sad regret the strong proud clock has now been set. Herb Beall composed this song for I think the going-away party for Bill's sabbatical leave in 1966 to Cambridge England to learn large-molecule crystallography of proteins. There is a reference to Bill "working every night," which he did and which may have made the graduate students feel obliged do the same. When with eye both sad and tearful off the great Commander goes. Cynics say some men are cheerful now instead of work they’ll doze. Cynics say there’ll be much Hell-ing, when the great Commander leaves. But the truth I’m truly telling, every Trooper truly grieves. Never chide us or impede us, help us on to greater height. When the Leader says adieu, those not sighing are the few. Those not sighing, those not sighing, those not sighing are the few. Cynics say that they are fearful he’ll not work a single day. But the truth I’m truly thinking he’ll be working every night. Herb, after a few years out of school, looks back at days in Bill's lab at Harvard. In a golden sea of glory dwells an isle with silver tower. There stands Gibbs Lab famed in story where we spent our heaped on hour. And we criticized him blindly, un-appreciating him. Now with life we have to grips come. Now it’s life, which we must face. Oh, for days with Colonel Lipscomb and his easy going pace. And his wisdom we would question though we rue our words today. Wondering how one so neglected can win students lasting love. From our mouths unkindly quips come. Yes, we have abused him so. Oh, for days with Colonel Lipscomb and his nature calm and slow. How it can be so resistant to a world that’s harsh and cold. Quotas deadlines they’re not given. All exists for joy and light. No one ever sternly driven, no one ever works at night. To that island hopeful ships come that they may imbibe the cheer. Oh, for days with Colonel Lipscomb and the parties and the beer. Dr. Herbert Beall became a professor of chemistry at Worcester Polytechnic Institute and died in 2003. List of his students and publications. His ACS Obituary. Permission to make these songs available for free download and distribution was generously granted by Herbert Beall's widow, Barbara A. Beall. Kaesz, H. D., Bau, R., Beall, H. A., and Lipscomb, W. N., "Rearrangements in the Icosahedral Carboranes," J. Am. Chem. Soc. 89, 4218-4220 (1967). Beall, H. A. and Lipscomb, W. N., "Molecular and Crystal Structure of m-B10Br2H8C2H2," Inorg. Chem. 6, 874-879 (1967). Beall, H. A. and Lipscomb, W. N., "A New Method for the Preparation of B6H10," Inorg. Chem. 3, 1783 (1964). Bill was enlisted to help Hypho-Man in the boron entry in the Periodic Table of Comic Books by John P. Selegue and F. James Holler, University of Kentucky. As no real comic book mentioning boron could be found, they made up a fragment of one, complete with a story. "Hypho" signifies a polyhedral cage that is missing some vertices, a little like the upper half of the green borane structure below. This may be the most obscure and nerdy superhero name ever. The Harvard Lampoon had fun with Bill Lipscomb's project to determine the atomic structure of carboxypeptidase A by dubbing it deoxypreposterase in their 1968 parody of Life Magazine. Amazingly, the students spoofed the molecule correctly having not, as far as we know, talked to anyone in Bill's lab. They got it right that carboxypeptidase A is an enzyme that digests proteins. At least one of Bill's graduate students puzzled over what was up while watching them photograph the cheeseburger in Bill's large Kendrew model of carboxypeptidase A. The Lampoon showed Harvard students at their best, aggressive, creative, knowledgeable, and motivated. Although, had the students spoken to someone in the lab they might have been persuaded to place the cheeseburger higher up in the model at the active site (of digestion), which would have been a cool inside joke for the perhaps two or three people in the world who would care. Bill's Periodic Table of the elements: From Bil's collection, drawn for him by his second wife Jean C. Evans as work under a government contract and therefore in the public domain, reprinted on this website with permission from William Lipscomb. Dow Board, 2 photos: From Bill's photo collection, reprinted on this website with permission from William Lipscomb. The Clock, 1976: Photo by James Lipscomb. An early, abbreviated version of this web page is published under the terms of the Creative Commons copyright below in the book, The Selected Papers of William N Lipscomb Jr.: A Legacy in Structure-Function Relationships. Exception: Herb Beall's Songs are copypright by Herbert Beall and freely available under the Creative Commons License immediately above with generous permission of his widow, Barbara A. Beall.